Hollow Land is self-described as "a story about the eternal human search for a place to call home". Solomon and Berta are two seekers who arrive—in a seemingly sun-washed land that promises respite from their many journeys. Hollow Land (co-produced by Dansk Tegnefilm, Les Films de l' Arlequin, NFB with Arte France) is a 14-minute claymation film, which has been shortlisted for an Academy Award. Michelle and Uri Kranot are independent filmmakers. Originally from Israel, they have been living away from their “homeland” for many years, making films and projects in different countries. For the past eight years they have been working as artists in residence at “The Animation Workshop” in Viborg, Denmark. We planted many clues and signs that would pop up to an audience with a similar background, but we hope other people can find their angle in it. We used some photo realistic footage to enhance the twisted realism, but we pushed it further. The bathtub is a metaphor that could be translated in different ways. it is a basic item one feels intimate with, and the absurdity of taking it with you shows this longing for a safe place to live in. ZF: You mention in your commentary that the film is not really about being an immigrant, but about being displaced. The film almost reminds me of the Holocaust and the fate of Jews, being deported and sent somewhere else despite their will. Would you describe the film in those terms? So when we decided to take our bathtub and leave the place we born in, it felt like the natural thing to do. that is our heritage...Our grandparents came to Israel looking for a better place. we left Israel looking for a better place. Hollow land is a film about that. ZF: It is the first time you use puppets for your films, which were mostly cut-out or hand-drawn before. How did that affect the look and the story of Hollow Land? M&U: From the beginning we where looking for an animation look and style that will focus on the story and timing, and less on the movement. We loved the idea of having very limited expression and range, so everything will need to be based on a very precise timing and acting. The secret lies within the moments when there isn't much movement. this is where you reflect and think, and not occupied with translating what the eye is trying to capture. Still, there are couple of scenes that demanded a more fluid and complex animation for expression, and that's where we had to sweat. ZF: Your film looks wonderfully flat. Was that a conscious option, away from 3D gimmicks? M&U: There are very few 3D (CG) films we like. The ones that look like million dollar actually cost that much and are very commercial. We love the works of David O'Reilly, which are quite a counter-animation approach. Using the "2.5D" style was both being fascinated by the illusion of depth it gives you and economical and practical reason (The film was made at the Animation workshop, Denmark, A wonderful school for animation, specifically 2D and 3D, but not much in terms of stop motion facilities). ZF: Your previous films, White Tape (2010), The Heart of Amos Klein (2008) also investigate the theme of boundaries, but within a strong political angle.Do you think that animation can represent the political in a more forceful way than live-action? M&U: Potentially, yes. The contract between the filmmaker and the audience is different than live action, and specifically documentary film. The audience knows these are not real characters, this is not reality, it is all fabricated. But then, and that's the trick, the audience might be much more open to new ideas, much more reflective and accepting. ZF: How long did it take you to make Hollow Land, and could you describe the production process? There are many production companies involved. In total it took nine months to animate and 2 months for compositing. The film was finalised in Montreal for 3 weeks of music sound and on-line at the NFB. (Which included working with the legendary Normand Roger who did the adaptation and music arrangements). ZF: Do you think that the future in animation lies in co-production, at least in Europe? You yourselves originate from Israel, but live in Denmark at the moment. ZF: Hollow Land has been shortlisted for an Academy Award for best animated film. It is a small but artistic film. How do you feel being in the company of Disney and Get a Horse? M&U: It is true that our agenda and films lie very far from what is perceived as "Hollywood"... On the other hand, we are very proud to be on a list with Ushev's 'Gloria Victoria' and Dan Sousa's 'Feral', acknowledged as cutting edge stunning pieces of art. ZF: What are your future plans? Is there a new short in the making? Would you consider at some point advancing a feature film in the manner for e.g. Ari Folman's The Congress or is that too far-fetched a target? M&U: We are involved in several projects, very different from each other: We are working on a theatre project that includes animation, developing a feature length film (still hard to estimate how long, but longer than the films we made in the past). We are just finishing a short experimental animation named 'Black tape', the second part of a trilogy that started with 'White tape'. 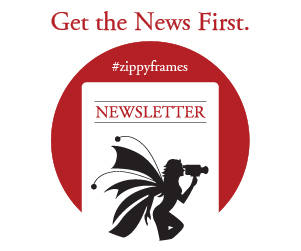 ZF: Michelle & Uri, thanks for talking to Zippy Frames.